Time for a new costume! I am working on a steampunk superhero costume for Emerald City Comic Con. How does that work? Take one well-known male superhero, a bunch of Victorian lady clothes, and put them in a blender! Or something like that. Here's the first piece of the costume. Ignore the skirt, it's not part of the costume. But in case you are wondering, the skirt is Simplicity 5006-D, bustled. I have one month to put it together, so I'm saving time by modifying store-bought patterns. 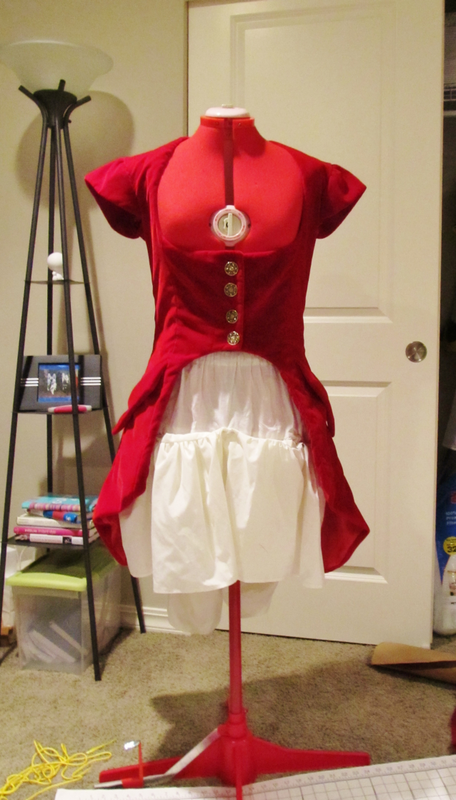 The first piece is a steampunk jacket based on the Simplicity 2172 pattern. 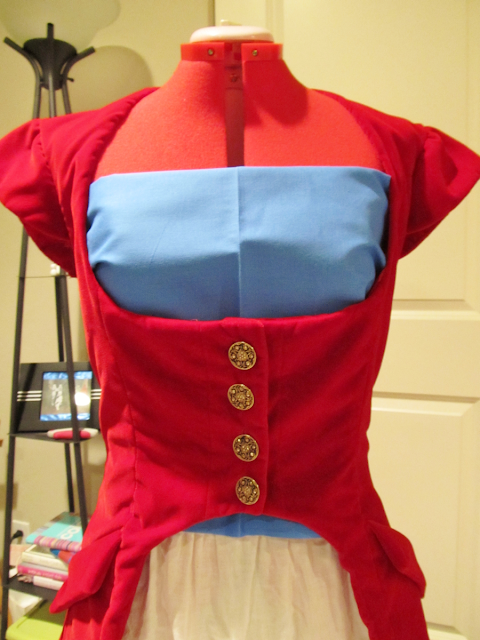 The blue fabric is there because I wanted to see what blue would look like under the red. I made a few adjustments to the original pattern. I left off the sleeves, shortened the bottom hem considerably, added two inches of height at the waist for my long torso and added extra panels in front where the buttons go so it wouldn't be so tight around the middle. I need room to breathe! 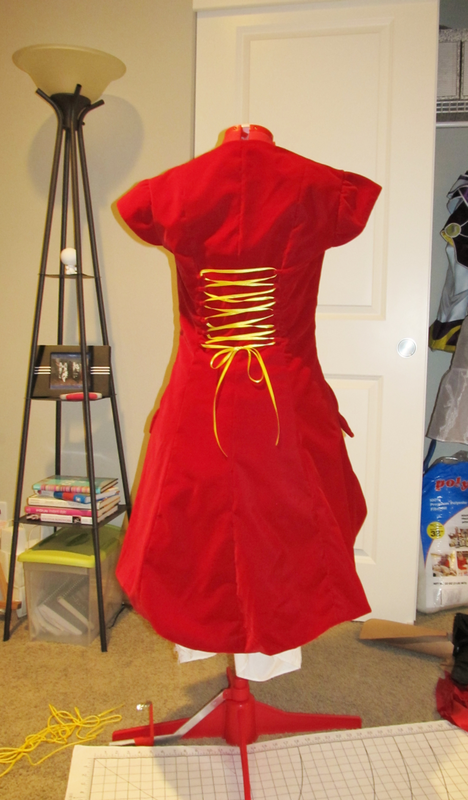 The jacket is made of red velvet with yellow ribbon and gold buttons. I've got my work cut out for me, that's for sure! Hey Avalyn, that's a really nice dress you've added in your post. I can't imagine how good it will look when someone will wear it. Looking really authentic and velvet is really magnificent. I was actually looking for some velvet fabric designs for my furniture, but I couldn't resist myself giving a comment here on your post. You can check the page below if you want furniture ideas with velvet fabrics. Ooh pretty velvets! Do you do any velvet burnout techniques yourself? I did it once for a handmaiden costume and it was pretty awesome, love the technique.